Jenny and Cody of the Cast & Crew Etsy shop down in Texas have an incredible selection of home goods I just had to share. You'll find a few Eames/Herman Miller pieces on their site at any given time. They rightly describe this one as an Eames treasure with the "tendency to rob the attention of any other object in the same room." Made in 1954, it's a white wire, side rocking chair with solid maple runners. In excellent condition...I want, I want. 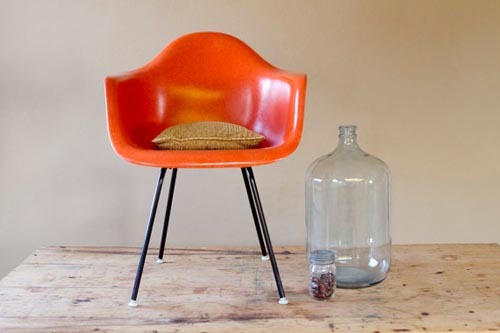 The iconic Eames armchair in orange is such a great find. I, myself am partial to sage green and am particularly drawn to this Eames side chair. It's in superior vintage condition with an iconic walnut dowl base.